Ground beef patty topped with a creamy mushroom-cheese sauce, thin-sliced black forest ham, fresh tomato, grilled onions and tangy horseradish Dijon sauce between two whole wheat buns. Sauté mushrooms in butter. Add shallots and garlic and cook until shallots are translucent. Deglaze the pan with white wine and let reduce by 2/3. Add Knorr® Culinary Cream Base and Boursin cheese and bring to a simmer to melt the cheese. Season to taste with salt and pepper. Combine all ingredients and chill until use. Spread Horseradish Dijon Sauce on bottom bun. 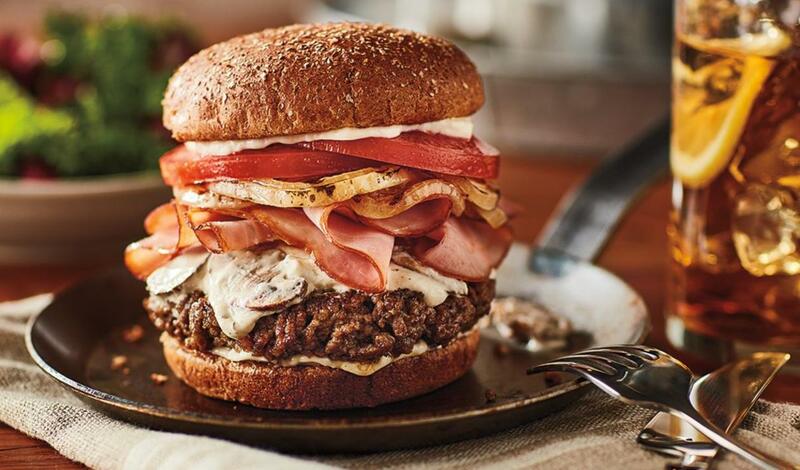 Build the burger by first topping the patty with Mushroom Boursin Cheese Sauce, then the remaining ingredients.